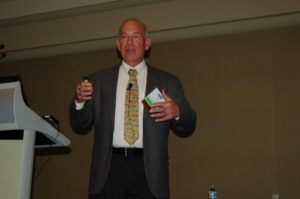 What a great meeting we had in Indianapolis last month. It is re-energizing to encounter many familiar faces and, at the same time, a large number of new repro enthusiasts gathering together to talk about what we love the most: how to improve reproductive efficiency in this ever-changing dairy industry. I would like to extend a big “thank you” to all in attendance. Our 2018 DCRC Annual Meeting was a tremendous success and this event would not have achieved this level of excellence without the active participation of attendees, speakers, board members and the continuing financial support from our sponsors. A well-deserved acknowledgement goes to Rafael Bisinotto, University of Florida, for leading our program committee, alongside Luis Mendonca, Kansas State University, and Anibal Nascimento, ABS Global, for working hard to deliver an exceptional program. Congratulations to the 24 dairies that received outstanding reproduction achievement awards. Their dedication to make this piece of their operation a success is an inspiration for all of us. Thanks to Corey Geiger, Hoard’s Dairyman and the awards committee for your dedication to make this recognition possible. And, thanks to all our consultants who nominated outstanding dairies. Please keep nominating your clients to receive this important recognition of their phenomenal work. As stated during our meeting, our organization is implementing a new strategic plan focusing on growth and expansion. During this process, your participation is needed and encouraged. Please make sure you reach out to our leadership team to find out how you can be part of this movement and volunteer your time and ideas that will benefit us all. As the year turns, we are excited to announce the new members of our board of directors. They will join our Past President Ronaldo Cerri and current board members Jeff Stevenson (treasurer), Paul Fricke and Matt Utt on the mission to drive our council for 2019. Please join me in extending a warm welcome to our new board members: Vice President Julio Giordano, Cornell University, and Luis Mendonca, Kansas State University. We will continue our mission to bring to you, DCRC members and dairy community, the best quality material to serve you as a reference to take your reproductive performance to the next level. Through our written articles and recorded webinars available on our website, live (and free) webinars throughout the year, and our annual meeting, we strive to provide the most applicable, relevant, unbiased and proven ideas for immediate implementation in your dairy to help you to achieve your reproductive goals. Make sure you follow us in our social media (Facebook and Twitter), like and share our posts, and subscribe to our eNewsletters. Your engagement is vital for the health and growth or our organization. Thank you again for a great year and be tuned in to what’s coming. The year 2019 will be a strong one for DCRC. Mark in your calendar our 2019 annual meeting in Pittsburgh, PA, November 13-14. We definitely want to see you there! Mastitis has been associated with pregnancy loss (PL) as a consequence of endotoxins or inflammatory responses on follicular growth, embryo development, and/or corpus luteum (CL) endurance. The economic loss of PL is estimated at $555 per case and the economic loss of mastitis ranges between $155 and $179 per case. However, the economic losses of PL attributable to mastitis have not been established. The study involved 2 exposure periods – 1 to 42 d before breeding or during gestation (1 to PL diagnosis day for case cows and 1 to 75 d for control cows). For primiparous cows, mastitis before breeding was not associated with clinical mastitis during gestation. Primiparous cows affected with clinical mastitis during gestation had 2.21 times greater odds of PL (95% confidence interval = 1.01, 4.83). Primiparous cows with embryo transfer had 2.04 times greater odds of PL compared to AI (95% confidence interval = 1.07, 3.86). Primiparous cows with lameness before breeding had 4.13 times greater odds of PL compared with no lame cows (95% confidence interval = 1.18, 14.41). The cost of clinical mastitis during gestation was $149, which includes the cost ($27) of PL attributable to mastitis. Researchers concluded that in primiparous cows, mastitis before breeding was not associated with PL. Clinical mastitis during gestation was a predisposing factor for PL. Furthermore, embryo transfer or lameness before breeding were also predisposing factors for PL. For the present study, the cost of clinical mastitis during gestation was $149, of which $27 is the cost of PL attributable to mastitis. Luteolysis was induced with PGF2α on d 7 of the wave and ovulation was induced with GnRH 56 h after PGF2α regression. All cows received AI 16 h following GnRH. Pregnancy and pregnancy losses were measured. Cows with single ovulation assigned to L/L treatment had greater preovulatory follicle diameter compared with L/H and H/L treatments. Cows with low progesterone, at either the predominance phase, dominance phase, or both phases, had increased double ovulation rate compared with cows in the H/H treatment. Cows with double ovulations had greater pregnancies per AI (P/AI) on d 23 post-AI compared with cows with single ovulations but had greater pregnancy losses if ovulations were unilateral. Cows in the L/L group had greater P/AI on d 23 post-AI compared with cows in the H/H group, but the full-term P/AI was not different among treatments. This was a result of the greater incidence of pregnancy losses between d 35 and 56 of gestation for cows with unilateral double ovulations compared with bilateral double ovulations and single ovulatory cows. The authors concluded that the hormonal environment of the growing pre-ovulatory follicle appears to be a regulator of subsequent pregnancy loss. Low P4 during follicular development created greater pregnancy losses from 35 to 56 d post-AI. Most of these losses were likely due to unilateral twins. Clinical and subclinical endometritis have been shown to have negative consequences in fertility. However, whether and how to treat endometritis still remains controversial. 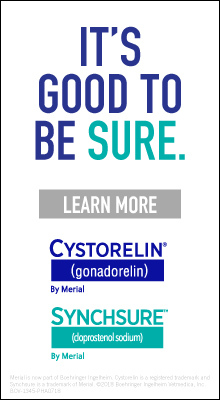 Several studies have looked into the use of PGF2α, with contradictory results. The objective of the current study was to perform a systematic literature search to analyze the overall treatment effect of PGF2α on reproductive performance by means of a meta-analysis and to provide an update of a prior meta-analysis on the efficacy of the treatment of bovine endometritis with PGF2α performed by the authors (Haimerl et al.) back in 2013. The outcomes evaluated were: calving to first service interval and calving to conception interval. Out of 94 initial publications, after applying the exclusion and inclusion criteria, only 7 studies were included in the meta-analysis on the effect of treatment of bovine endometritis with PGF2α on calving to first service interval and 9 studies were included in the meta-analysis on the effect of treatment of bovine endometritis with PGF2α on calving to conception interval. The use of PGF2α for the treatment of bovine endometritis did not affect the calving to first service interval compared with control cows. The use of PGF2α for treating bovine endometritis might result in an increase of the calving to conception interval compared with control cows. Based on the results of the meta-analysis, the authors do not recommend the treatment of bovine endometritis with PGF2α as a means to improve reproductive performance. When immigrants from Belgium, Germany and Bohemia landed in Kewaunee County, Wisconsin, (located between Green Bay and Lake Michigan) during the late 1800s/early 1900s, they realized they found a “wonderful” place to dairy farm. The peninsula location provided cooling summer breezes and fertile soil for growing alfalfa. Herd size was generally based on family size – about two cows per family member. By 1983, when Don Niles arrived in Kewaunee County as a young bovine practitioner, some herds had 200 cows. Niles, who spoke at the 2018 Dairy Cattle Reproduction Council (DCRC) Annual Meeting, left Wisconsin in 1998 and headed to The Golden State. In California, he learned about managing large dairy herds. Niles returned to America’s Dairyland three years later to build Dairy Dreams with the late John Pagel. At that time, the 1,400-cow dairy was Kewaunee County’s largest. Today, at 2,900 cows, it’s the county’s 10th largest dairy operation. While building Dairy Dreams presented some challenges, there are larger hurdles today as he works to educate consumers that dairy producers care about the land and environment. While Kewaunee County’s heritage lies in dairy and crop farming, its current demographics revolve around a more suburban image – with several “transplants” from Milwaukee and Chicago. “These people love the scenery and lakeshore, as well as the rural and open landscape; but they were a little miffed to find smelly cows, smellier manure and tractors rolling up and down the fragile roads at all hours,” said Niles. Lacking farm backgrounds – or even family connections to farming – these “new neighbors” typically don’t understand or appreciate what it takes to operate a dairy farm. “More and more, we have neighbors who regard farming practices as some sort of personal attack, or at the very least a sign of carelessness or incompetence on the dairy’s part,” said Niles. Talking the same language is also a challenge. “For example, if we tried to explain that we were not overapplying manure to a field because our agronomist calculated the correct amount of manure for the soil conditions and agronomic need of the crop, we sounded like we were trying to ‘pull a fast one’,” said Niles. A more effective explanation involved using “consumer” terms. For example, they explained that each 8,000-gallon semi-tanker filled with liquid manure contains the same level of nutrients as five bags of Scotts Turf Builder fertilizer. Given this scenario, the area dairy community created Peninsula Pride Farms (PPF), a farmer-led watershed initiative. PPF members committed to this central notion. “We understand and accept that as the main land operators on our peninsula, we are significant contributors to any contamination in our ground and surface waters,” said Niles. Furthermore, they committed to working together as a group of farmers, as well as with other similar farm groups, to identify and implement new best practices to be more protective of their ground and surface water. Peninsula farmers need to accept their role in contributing to the problems if they want to be credible in creating solutions. 98% of the U.S. population is far removed from agriculture. They often get info from the Internet – not personal experience. Until people are clear that you care about the things you do that impact them, they will want to deal with you through regulations – not personal contact. Farmers need to establish trust and recognition. Reasonable people are not expecting perfection from farmers, but they expect farmers to care. 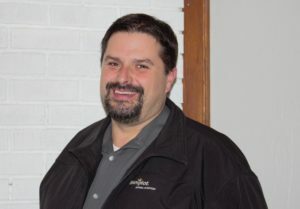 As the sales and marketing manager for Simplot Animal Sciences, Jeremy Howard is responsible for all sales and marketing activities within the group. Simplot Animal Sciences is a relatively new commercial venture for the Simplot Company. Established about 16 years ago, the group focuses on the application of new and emerging technologies in agriculture. In 2014, Jeremy’s team commercialized its first product – IVF embryos. These commercially produced IVF embryos are branded as SimVitro. In addition to producing and selling these embryos, the team explores the use of innovative technologies to provide solutions to beef and dairy cattle producers, so they can improve efficiency, productivity and profitability. How did Jeremy get to this point in his career? He was born and raised on a small alfalfa and beef ranch in Idaho Falls, Idaho. Following high school, he spent two years in the Chicago area. Two years later he returned to Idaho and attended Ricks College in Rexburg, Idaho, for 1.5 years to pursue a degree in animal science, with plans to become a large animal veterinarian. After Ricks College, Jeremy transferred to the University of Idaho with the ultimate goal of attending veterinary school. Jeremy became interested in cattle reproduction his sophomore year of college when he took a reproduction course. The course exposed him to embryo transfer and artificial insemination (AI). When veterinary school didn’t become a reality, Jeremy decided to pursue an advanced degree that focused on cattle reproduction. As an undergrad, Jeremy worked as the university’s beef center assistant manager. “This job further fueled my love for cattle and reproduction,” he said. “I also found a new passion for Charolais cattle.” During his senior year, Jeremy decided to attend graduate school – studying reproductive physiology under the supervision of Amin Ahmadzadeh. Additionally, he started a small herd of purebred Charolais cattle, using genetics purchased from the University of Idaho’s herd. Jeremy’s master’s degree examined strategies to improve reproductive efficiencies in beef and dairy cattle. He conducted two studies in beef cattle and one in dairy cattle. Each study looked at changes that could be made in estrous synchronization protocols to increase conception rates. After earning his master’s degree, Jeremy began working as a herdsman for an Angus ranch in January of 2006. Six months later, he accepted a sales manager position with BioTracking LLC; and in 2012 he became the director of sales and marketing. This company focused on developing and commercializing a blood-based pregnancy test for ruminant animals. Despite the industry’s progress in getting cows pregnant, Jeremy feels the next challenge is taking repro efficiency to the next level – pregnancy rates beyond the 30s. “I think DCRC provides a venue where everyone can discuss this opportunity and make it a reality,” he said. Overall, Jeremy says his DCRC membership provides tremendous value. “The programs are always great,” he added. The J.R. Simplot Company, a privately held agribusiness firm headquartered in Boise, Idaho, has an integrated portfolio that includes phosphate mining, fertilizer manufacturing, farming, ranching and cattle production, food processing, food brands and other enterprises related to agriculture. Simplot’s major operations are located in the United States, Canada, Mexico, Australia and China, with products marketed in more than 40 countries worldwide. The company’s mission statement is Bringing Earth’s Resources to Life. Just one webinar remains in this year’s Dairy Cattle Reproduction Council webinar series. These highly regarded sessions offer attendees from across the United States and around the world access to high-quality information and interaction with industry experts from the comfort of their farm or office. The webinars feature top-rated topics from previous DCRC Annual Meetings, as well as other areas of reproductive importance. 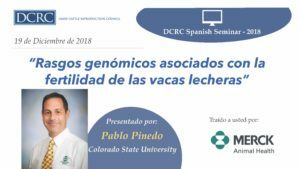 Pablo Pinedo, Kansas State University, will address Rasgos genómicos asociados con la fertilidad de las vacas lecheras (Genomic Traits Associated with the Fertility of Dairy Cows), December 19, 2018, at 1 p.m. Central Time. To register for this webinar, please visit Webinars and follow all prompts. As the webinar approaches, you will receive an e-mail with information on how to log in for attendance. For more information, e-mail Fabio Lima at: flima@illinois.edu or e-mail DCRC at: dcrc@dcrcouncil.org. If you are a DCRC member and cannot attend the “live” webinar, you may access it (and all past webinars) at dcrcouncil.org.